A pursuit that began in Los Angeles' San Fernando Valley Monday morning continued for nearly three hours before the driver was arrested in a San Diego County neighborhood. "Sir, what are you trying to do?" she told an officer as she was seated in the back of a patrol car with her feet tied. "You swear like I’m a criminal, like an assassin or something, where you’re hogtying me and everything. This is unfair." The chase ended shortly after the woman crashed her Saturn sedan into at least one parked vehicle and drove across the front lawn of a home in Fallbrook, more than 120 miles south of where the chase started in the Woodland Hills area. 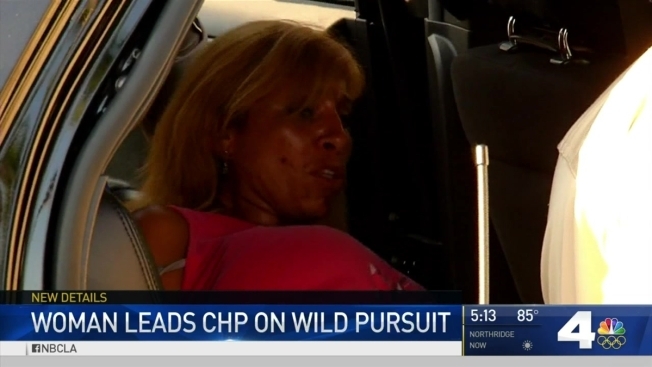 She got out of the vehicle and surrendered after CHP officers used their SUVs to set up a road block on the street. The pursuit began around 4 a.m. when officers saw a driver in a Saturn sedan weaving across lanes on the 101 Freeway in the San Fernando Valley. The driver continued onto the 105 and 710 freeways before driving onto streets in Long Beach. The driver then entered Orange County on the 5 and 73 freeways and continued on freeways into northern San Diego County. The pursuit in Fallbrook entered several cul-de-sacs, where the driver made U-turns to avoid officers. The driver continued across the front yard of a home after a failed PIT maneuver left the car's rear bumper dangling from the vehicle. A resident at the home said she thought the noise outside was a sanitation truck, but was surprised to learn a high-speed pursuit had come to her neighborhood. The Saturn left a chunk of turf on the driveway and tire marks through the grass. The driver came to a stop when she encountered at least three CHP vehicles blocking the street.